A Durango GREEN BUSINESS OF THE YEAR award recipient, Carvers has made every effort to protect our future by using thoughtful alternative and sustainable energy solutions. We lead by example by doing everything possible to become more environmentally responsible, and hope that our alternative powered, eco-conscious restaurant and brewery sets the standard. 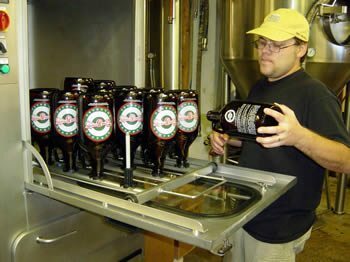 In an effort to reduce our environmental impact, we sell beer in Growlers. These are refillable jugs that provide you, the consumer, with a cheaper better way to buy beer, while also helping the environment. Why Love Refillable Growlers and Kegs? Save Money: Do the math – we challenge you to find better beer for a better price, period. Save Resources: Possibly the most eco-friendly beer anywhere: Customers re-using our jugs have kept over 1.2 million bottles and cans out of the wastestream. Our brew pub is solar-hot-water heated and entirely wind powered. No fossil fuels are used to transport our beer. 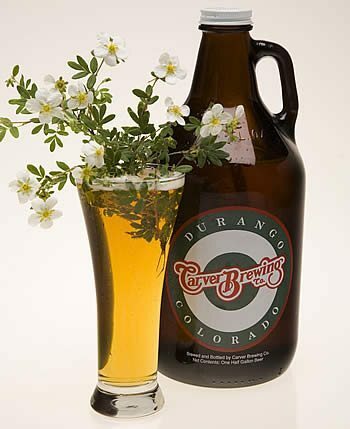 Savor Good Taste: We offer 10 distinct beers to ensure a favorite for everyone, available at only one place in the world: 1022 Main Ave in Durango, Colorado. 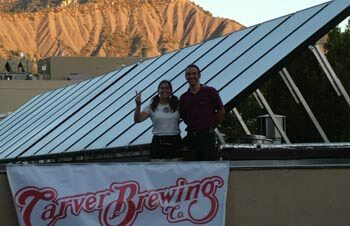 In April 2008 Carver Brewing Co. installed 16 solar collectors, the largest solar hot water system in Durango at the time. The array not only heats water but heats the restaurant. The array of collectors you see feeds into a solar heated water storage that has a 900 gallon capacity. Carvers was the first 100% Wind powered Restaurant and Brewery in Durango. We purchase all of our electricity as “Green Power”, electricity generated from clean, renewable resources. This renewable energy and its attributes, comes from wind- generating facilities across the western United States. 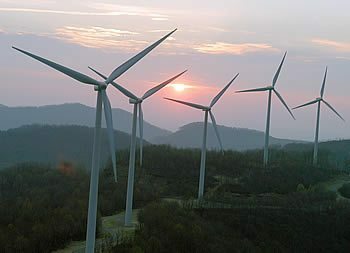 We are proud to be members of AWEA (American Wind Energy Association) and participate in the LPEA Green Power Program . We offer beer made with 100% organic ingredients. Spent grain from brewing is used by local ranchers. Brew system recaptures and reuses brewing water. State-of-the-art jug and keg washer further reduces water waste. Carvers is a presenting sponsor of the Green Business Roundtable. Supporter of sustainable, local businesses and farmers. Named 2010 Green Business of the Year.